This low carb chicken salsa verde recipe is made with fresh tomatillos and is tart, tangy and tasty! 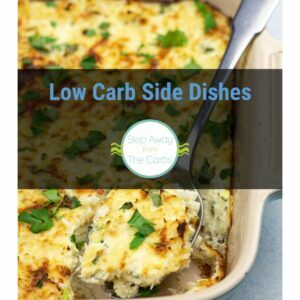 An easy keto recipe. 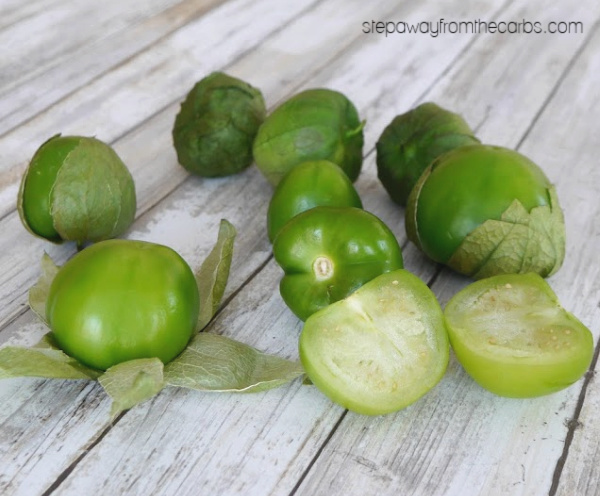 I remember trying to make a salsa verde when I was living in the UK – fresh tomatillos were unheard of, canned ones rare. So it is a delight to have these tart little fruits readily available to me now that I live in the US. And this dish shows off their wonderful flavor perfectly! 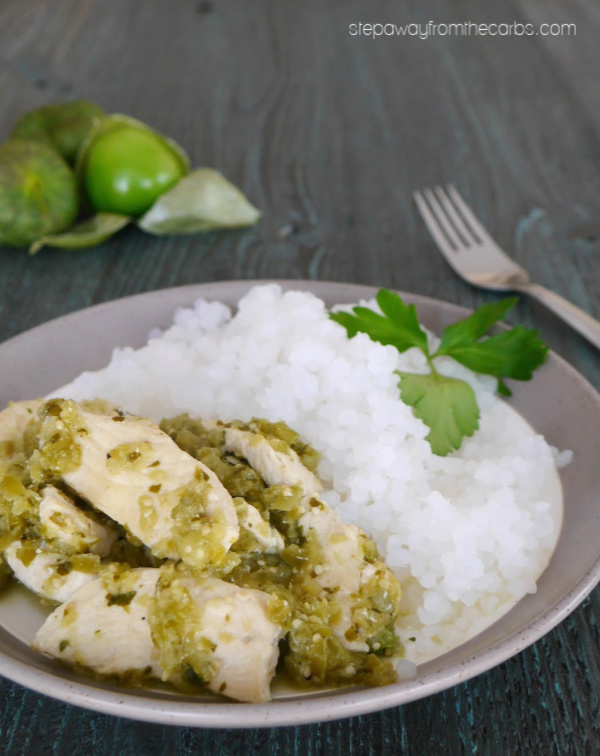 Add roughly chopped tomatillos, fresh cilantro, green onions, and ground cumin to a blender or food processor. Blend until you get a salsa-like consistency. 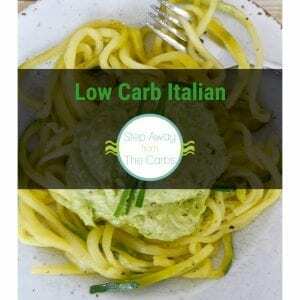 This can be prepared in advance – which I like to do because it means I can get the blender all washed up and put away ahead of time! Alternatively, you can easily make it while the chicken is cooking! Chop the chicken into thin slices and sauté in olive oil in a large skillet until browned all over. Add the salsa verde, bring to a boil, then reduce heat and fast simmer for 15 minutes until most of the liquid has evaporated. Check for seasoning and add salt and pepper if necessary. 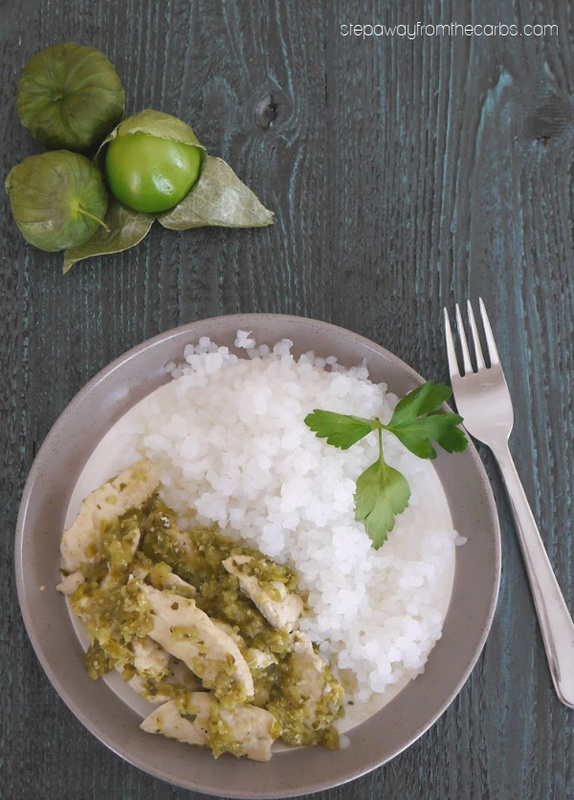 This chicken salsa verde dish can be served with salad, veggies, shirataki noodles or rice (as shown here) or wrapped into low carb tortillas. Sour cream makes the perfect accompaniment! Heat the oil in a large skillet and sauté the chicken strips in olive oil until browned all over. 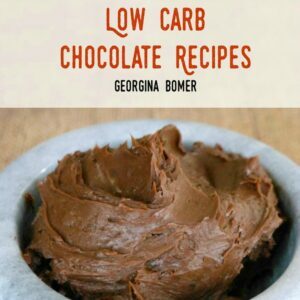 Meanwhile, add tomatillos, cilantro, green onions, and cumin to a blender or food processor. 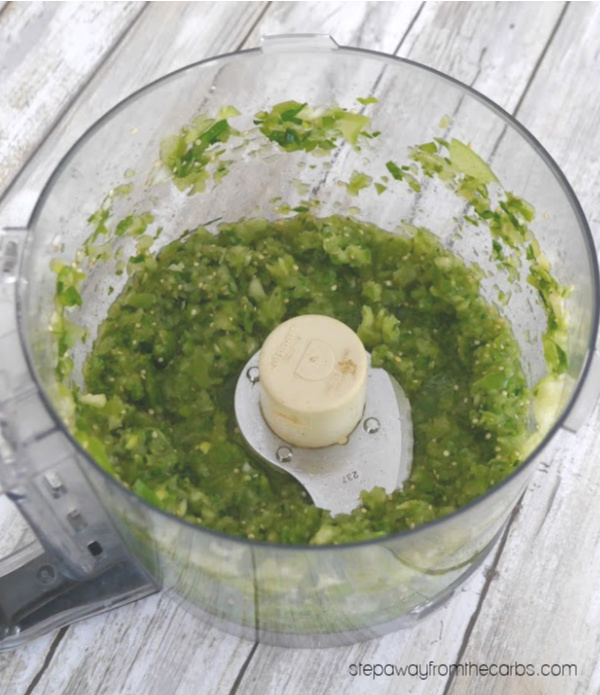 Blend to a loose salsa consistency. 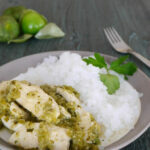 Add the salsa verde to the chicken, bring to boil, and fast simmer for 15 minutes. Taste for seasoning and add salt and pepper as necessary.